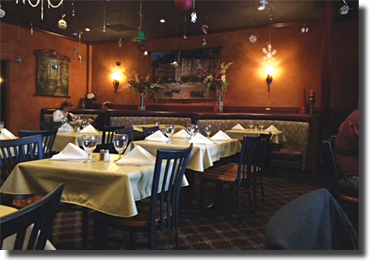 Mario’s Portofino is a delightful family-owned Italian restaurant with great food. 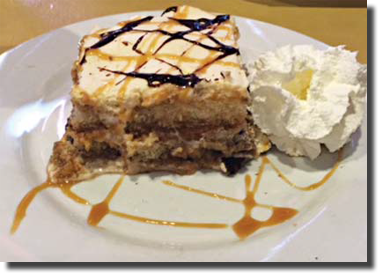 Located in the MidTown district in a shopping center off South Virginia Street, Mario’s Portofino is Italian cooking at its best. Quiet and romantic, Portofino’s has great ambiance coupled with authentic Italian cuisine. From the Seafood Salad to delicious Linguine, Portofino is a tasty dining experience. Portofino’s has great ambiance coupled with authentic Italian cuisine. Open for lunch and dinner, Portofino uses the finest homemade pasta and freshest local ingredients for all recipes. Appetizers include Polenta Porcini, Bruschetta, Steamed Clams, Mozzarella Caprese, and Classic Calamari Fritti, to name a few. 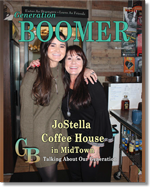 Soup and Accompanying Salads feature Zuppa Del Giorno, soup of the day by bowl or cup, or Insalata Della Casa, mixed greens with house made balsamic vinaigrette. Featured salads include Insalata Di Cesare made with Caesar dressing and shaved parma cheese. Salmon, Chicken or Prawns can be added. There is also Insalata Mediterranea with Feta, Kalamata olives, and red onion and tomato; Spinach Salad with sliced apples, candied walnuts, and Gorgonzola crumbles; or Goat Cheese Salad with pomegranate vinaigrette, fried panko Goat Cheese Balls with pistachio and cranberry. Wonderful! 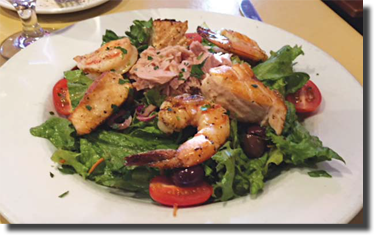 Seafood Salad .... Salmon, Shrimp, Albacore Tuna, Olives and Tomatoes with mixed greens. Dinner features a wide variety of entrees such as Pasta, Risotto & Gnocchi, Seafood, Chicken, Veal, Pork, Beef and Lamb. Samples on the menu from each category include Salmon Alla Sorrentina, pan seared salmon, artichoke hearts, mushrooms, sun dried tomatoes and light wine sauce; Pollo Marsala, sautéed chicken breast with mushrooms in marsala wine sauce; Vitello Parmigiana, breaded veal with marinara and mozzarella; Port Chop San Fermo, breaded pork chop topped with fresh arugula, tomatoes, fresh garlic, lemon with basil and capers; Filetto Balsamico, pan-seared beef tenderloin in a balsamic vinegar reduction served with garlic parmesan mashed potatoes; and Agnello, rack of lamb with fresh herbs in a cabernet wine reduction. 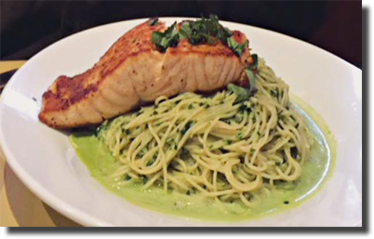 Early Bird Dinner Specials are Monday - Thursday, 56 p.m., featuring Fettuccine Alfredo, Spaghetti and Meatballs, Fusilli Salsiccia E Vino, Piccata, Marsala, and Calamari Steak. To finish your spectacular dinner, Tiramisu and other sweet delights round out the dessert menu. Portofino has an extensive wine list of reds, whites, red blends, and sweet diner wines. Wine is served by the glass or bottle. Vintages offered come from Italy, California, Spain, Argentina, and Australia. Cheers to Chef Roberto Gulizia who has captured an outstanding menu of Italian cuisine! Lunch served Mon. – Fri., 11:30 to 2 p.m.
Dinner served from 5 p.m.